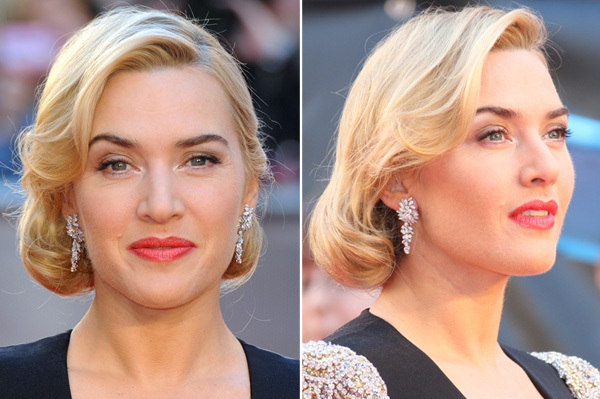 We have a total hairstyle crush on Kate Winslet’s elegant ‘do. Find out why in this week’s installment of Celeb Hairstyle of the Week! She’s undeniably one of the most popular actresses in Hollywood, and now the film that really made Kate Winslet‘s career blow up is coming back to theaters for a special 3D engagement. Titanic, aka one of the most iconic love stories of all time (duh! ), is returning to theaters April 6 in 3D and Winslet celebrated the re-release in London this week at the film’s premiere. We’re loving the elegant, regal ‘do she wore to the event… aren’t you? The hairstyle is age-appropriate and chic without being boring, and we love how upon first glance you’re left wondering: Is it an updo? Is it her hair pinned under? What is it? In case you were wondering, it’s actually a faux-bob with pinned curls. Super cute, no? We’re loving Kate’s cute hairstyle! How about you? Sound off in the comments! And check out other celebrity hairstyles!